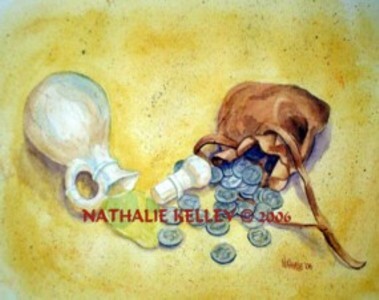 Nathalie Kelley's Art - What Price? While Jesus was in Bethany, in the home of a man known as Simon the leper, a woman came to him with an alabaster jar of expensive perfume, which she poured on his head as he was reclining at the table. When the disciples saw this they were indignant. “Why this waste?” they asked. “This perfume could have been sold and the money given to the poor.” Jesus said to them, “Why are you bothering this woman? She has done a beautiful thing to me. The poor you will always have with you but you will not always have me. When she poured the perfume on my body she did it to prepare me for burial. I tell you the truth, wherever the gospel is preached, what she has done will also be told.” Then one of the Twelve-the one called Judas Iscariot-went to the chief priests and asked, “What are you willing to give me if I hand him over to you?” So they counted out for him 30 silver coins. Matthew 26:6-16. To Judas, Jesus was worthy only 30 pieces of silver. To Mary, Jesus was worth everything. What is Jesus worth to you?